The 2014 World Taekwondo Hanmadang Opening Ceremony which seeks to keep alive the original spirit of Taekwondo as martial arts was held in Pohang Gymnasium, on the 21st of August. The Taekwondo Hanmadang in Pohang for four days including 3,400 athletes from 53 nations aims to develop Taekwondo not only as a sport which has a competitive style of games but as a form of martial arts. Various events and performances such as demonstrations of breaking tiles by martial arts performance team, TaekwonMoo(Taekwon dance) by a children's performance team both from the Kukkiwon were shown. Also a special performance was given by Spain's Millennium Chorus. They got much applause from the audience after chanting the Korean folk song 'Nar Jom Boso(Please Look At Me)' followed by Spanish folk songs. Jeong ManSoon, President of The World Taekwondo Headquarters Kukkiwon said in his opening speech, "Taekwondo is now facing a different era that asks it to function as a cultural event. With this trend, we the Kukkiwon will try our best to go forward with Taekwondo people all around the world." 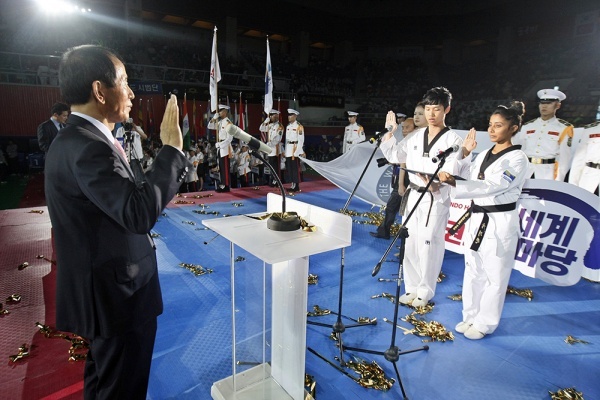 Kang-Deok Lee, the mayor of Pohang city, stated that, "Taekwondo spreads Korean culture throughout the world, and it possesses an important role in connecting the Korean people to the world in a global network." He added, "I hope this competition will be an opportunity to show hospitality and love to one another through Taekwondo." Spectacular performances caught the audiences' attention from the morning's preliminary matches. This year's competition takes place in 5 different arenas in the Pohang Gymnasium, displaying a progression of Poomsaes, Power Breaks and General Contests in each at the same time. The Fist and Hand Blade Power Break competition was received with great enthusiasm since it was the highlight of the Hanmandang. However, there was also some sad news. Ki-Nam Lee(41), representing the Taekwondo Association for the Disabled in Paju, was disqualified for tardiness, causing a sensation in the audience. Lee's left hand is completely damaged and his right hand is partially half damaged from a burning accident. In spite of his condition, he had been working as a coach in a Taekwondo class in Paju to encourage his fellow athletes and students. He had cultivated his Power Break skills 3 times a week for nearly a year, but unfortunately, his determination to show his talents was discouraged. Kukkiwon heard of Lee's heartbreaking circumstances and decided to arrange an extra match for him on the 22nd after the Power Break competition, offering him an opportunity to participate in the event. Starting on the 22nd, the highly anticipated national league of Power Break in Master and Foot Power Break Senior and Master Championships will take place. On the 23rd, final rounds in Power Break and High Jumping Break, as well as Poomsae will take place. 세계 태권도인의 큰 잔치이자 태권도 고유의 무술성을 발전시키기 위한 2014 세계 태권도 한마당이 21일 포항실내체육관에서 화려한 막을 올렸다. 오는 24일까지 나흘동안 세계 53개국 3천400여명의 선수단이 출전한 가운데 펼쳐지는 세계 한마당 축제는 겨루기 위주로 진행되는 올림픽 스포츠 경기에서 벗어나 품새와 격파 등 무예로서의 태권도 발전을 목표로 펼쳐진다. 대회는 21일 오후 4시 대회장인 정만순 국기원장, 명예대회장인 이강덕 포항시장과 김일문 대회조직위원장, 홍문종 국기원이사장 등 과 지역 주요 인사, 세계 태권도인 및 시민 등 4천여명이 참석한 가운데 열린 개막식부터 감동속으로 이끌었다. 식전 공개행사로 국기원 시범단의 격파시범에 이어 개회식 기념공연으로 나온 국기원 어린이시범단의 역동적인 태권무와 절도있는 동작을 접목한 공연 마지막 부분에서 대형태극기를 앞세워 애국가가 울려퍼지자 선수단과 관객 모두가 일어나 애국가를 부르며 빨려 들어갔다. 이어진 스페인 밀레니엄합창단은 스페인 민요에 이어 한국민요인 '날좀 보소'를 신명나게 부르자 관객들도 어깨를 들썩이며 박수갈채를 보냈다. 이어 열린 개회식에서 정만순 국기원장은 대회사를 통해 "태권도는 이제 무예스포츠의 벽을 넘어 문화콘텐츠로 확대해 나가야 하는 시대적 전환기를 맞고 있다"며 "이를 위해 국기원은 지구촌 가족들과 한발 더 다가가기 위한 노력을 기울여 나갈 것"이라고 밝혔다. 또 이강덕 포항시장은 환영사를 통해 "태권도는 세계속에 한국문화를 확산시키고, 우리 한민족과 세계를 연결하는 글로벌 네트워크에서 큰 역할을 하고 있다"며 "이번 대회를 통해 태권도 정신을 바탕으로 세계인과 우리가 서로 호혜의 마음으로 봉사와 사랑을 나누는 계기가 돼 주기를 바란다"고 말했다. 한편 이날 오전부터 시작된 예선전부터 불꽃튀는 경연들이 이어졌다. 이번 대회는 포항실내체육관내에 마련된 5개의 경기장에서 품새와 격파, 종합경연이 동시에 진행된다. 특히 '한마당의 백미'로 불리는 주먹과 손날격파 부문은 예선전부터 선수단은 물론 관객들로부터 뜨거운 응원을 받으며, 경기가 펼쳐졌다. 대회 첫 우승의 영예는 술이홀태권도시범단이 차지했다. 술이홀은 이날 국내팀 대항 종합경연 주니어 통합부문에서 출전 14개팀과 경합을 펼쳤으나 장애물 딛고 180도를 돌며 연이어 주먹과 앞차기를 연결하는 새로운 고난도 신기술을 선보이며 금메달을 목에 걸었다. 팀 대항 종합경연은 지정된 종목의 태권도 기술동작(창작품새, 호신술, 한번뛰어격파, 여러표적격파, 회전격파, 창작격파, 위력격파 등)들을 다양하게 창작 구성하는 경연이다. 경기도 파주시 장애인태권도협회를 대표해 출전한 이기남씨(41)는 이날 경기시간을 잘못 체크하는 통해 뒤늦게 도착해 실격처리돼 주위를 안타깝게 했다. 그는 이번 대회를 위해 1년가까이 매주 3회이상씩 격파훈련을 하며 준비해 왔지만 그동안 갈고닦은 기량을 선보이지 못하고 말았다. 그러나 이씨의 이같은 안타까운 사연을 전해들은 국기원은 22일 격파경기가 끝난 뒤 번외경기를 마련해 참여기회를 제공한다는 방침이다. 한편 대회 둘째날인 22일부터는 이번 대회의 백미인 격파 국내부문 마스터부와 발격파 시니어 및 마스터 결선경기가 펼쳐지는 등 태권도의 진수를 맛볼 수 있다. 23일에는 높이뛰어 격파 결선, 종합격파 예선 및 본선, 각 부문별 품새경기가 펼쳐진다.